While the SuperMicro2 measures quite flat, it is not the kind of sound that I like. I prefer my speakers to have more clarity and midrange presence. The SuperMicro3 sets out to achieve this. To get the sound I’m after, I replaced the Peerless BC25SC08-04 with a top mounted 1″ fabric dome HiVi TN28 tweeter. From previous tests, the TN28 is quite comfortable when crossed at about 2.5kHz. The Black plot in Fig 1 is the RAW response of the HiVi TN28 tweeter. The Red plot is with my electronic crossover set at 2.6kHz (24dB/oct, Linkwitz Riley). Fig 2 is the Frequency Responses of the FE85 with a bandpass of 250Hz and 2.6kHz (24dB/oct). Compare that with the responses of the SuperMicro2 (Fig 3), we can see clearly the acoustic crossover frequency has shifted from 3.5kHz to 2.6kHz. Changing this frequency is significant. The character of the speaker takes on a completely different complexion. Fig 4 is the summed responses of the SuperMicro3. 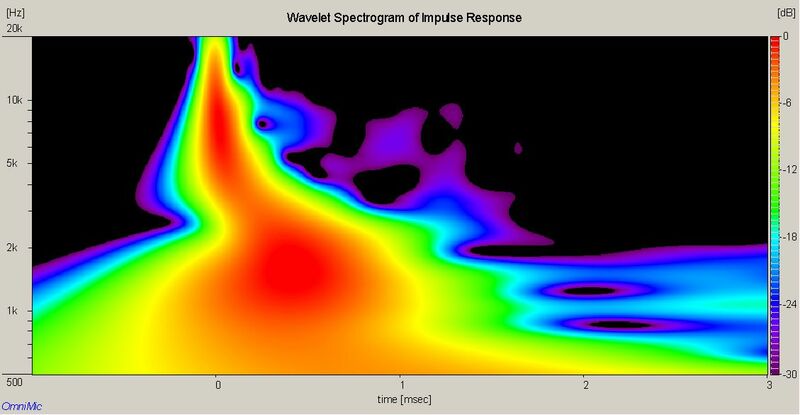 The Blue plot is with the TN28 in Reversed Phase whereas the Brown plot is absolute. Note there’s hardly any difference. This indicates that the acoustic centers of the FE85 and the TN28 have overlapped. Whereas in the summed responses of the SuperMicro2 (Fig 5), the shape of the null indicates there’s no overlap. Fig 6 shows the SuperMicro3 integrated with the Toucan Bandpass Subwoofer. As before, the Bandpass Sub is Low Passed at 250Hz (24dB/oct Linkwitz Riley). Fig 7 shows the full bandwidth when the SuperMicro3 is supported with the Toucan. The measurements below 500Hz include room reflections. Fig 8 is a highly magnified (1.0ms) Waterfall plot of the SuperMicro3. The plot is not as clean as the SuperMicro2. Most notable is the “hotness” from 1kHz~3kHz. Fig 9 – SuperMicro3 Toneburst Energy Storage. Impulse Window = 5ms. Fig 9 is the Toneburst Energy Storage plot of the SuperMicro3. There are some excess energy (blue slices) in the upper mids and the treble. The Spectrogram (Fig 10) of the SuperMicro3 is the most telling. We can see how much “hotter” the SuperMicro3 is from 1kHz~2kHz when compared to the superMicro2. That’s due to the acoustic centers overlapping that I mentioned earlier. The Red plot in Fig 11 is the 2nd order harmonic of the SuperMicro3. The Violet plot is the 3rd harmonic. Even though there’s a hump at 1kHz, it is quite benign because it is 2nd harmonic. The SuperMicro3 sounds exactly the way I was hoping it would. Now, the vocals and instruments have more presence and clarity. This is due to a combination of factors, namely changing over to the HiVi TN28 tweeter and crossing lower at 2.6kHz. On paper, the SuperMicro2 looks better but in reality, the SuperMicro3 sounds superior. This goes to show that when it comes to sound, no measuring equipment can replace the human ear.